I left the Lyric Opera House humming “Au fond du temple saint” after watching Lyric Opera of Chicago’s The Pearl Fishers, and I woke up the next morning to find that the tune was still in my head. It’s one of those infectious earworms that elicits a raw sentimental response, hitting you in the gut and bringing tears to your eyes. There were no weak links in this Lyric production: the phenomenal vocal performances struck emotional chords again and again; Zandra Rhodes vibrant sets and costumes charmed the eye; and the orchestral colors from Sir Andrew Davis’ treatment of Bizet’s wonderful instrumentation were a delight to the ear. First performed at the Théâtre-Lyrique in Paris on September 30, 1863, Georges Bizet’s The Pearl Fishers (Les Pêcheurs de Perles) was immensely popular with audiences, but much less so with critics. One notable exception was the critic Hector Berlioz, who wrote that the opera was “full of fire” and commented on the great number of extremely beautiful musical moments. The story takes place in Ceylon (Sri Lanka) in ancient times (Lyric’s production sets the story in the 19th century), and tells of a love triangle among Zurga, the man elected leader of the pearl fishers, Nadir, Zurga’s friend who recently returned from a series of grand adventures, and Leïla, the priestess whom both men have fallen in love with. 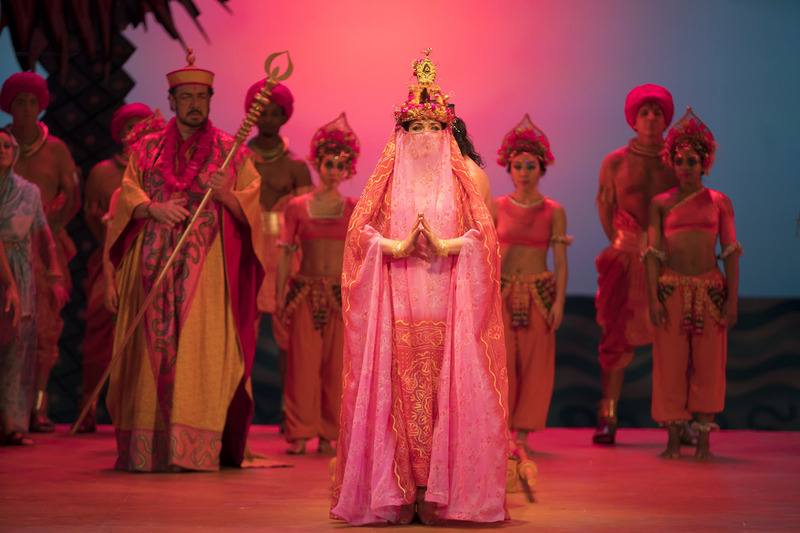 The fourth solo role in the opera is Nourabad, the high priest who guides and instructs Leïla. Zurga and Nadir have pledged allegiance to one another, promising to honor their friendship and forgo their amorous pursuit of the mysterious Leïla. Ultimately Nadir succumbs to his longing for Leïla, and the priestess falls in love with him as well. The two lovers are scheduled to be executed for their transgressions, but Zurga saves them when he distracts the villagers by setting the town on fire, thereby sealing his own fate. The story and libretto are rather mediocre, but the 24-year-old Bizet set the text to exquisite music. 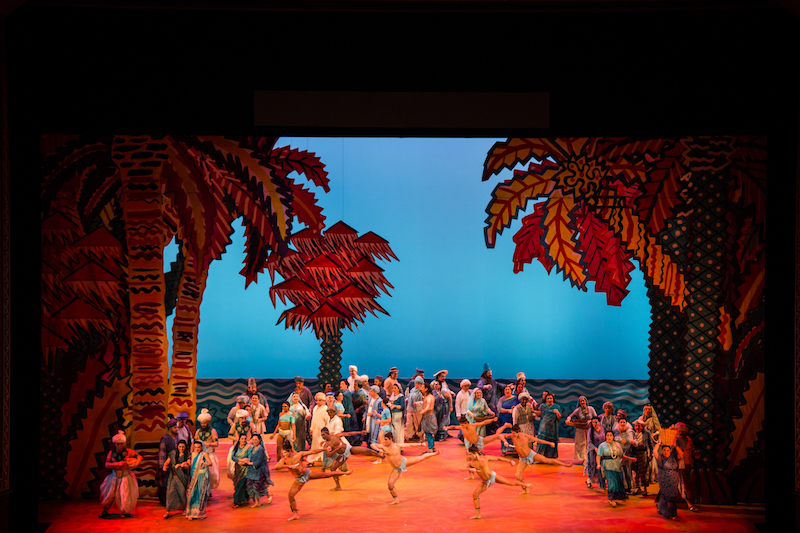 One of the first things audience members will notice is the colorful sets and costumes, designed by Zandra Rhodes. All the characters connected to religion wear a beautiful silky orange, while other villagers wear blue, perhaps to connect them to the water that plays such an important role in their lives. The vocal performances in all of Lyric Opera of Chicago’s productions this season have been extraordinary, and those in The Pearl Fishers were no exception. Playing Zurga, Polish Baritone Mariusz Kwiecień warmly embraced the audience with his solid, inviting, and velvety tone. Prior to the beginning of the third act, we learned from Lyric Opera of Chicago General Director Anthony Freud that Mariusz wasn’t feeling well, so he asked the audience for understanding. In typical Chicago fashion, the audience cheered on the baritone in a gesture of love and support when Mr. Freud said that Mariusz would continue with the performance despite his health. The applause must have lifted Mariusz’s spirits, for his vocal strength seemed to swell in Act III; his lower register was louder, and not a single note gave even a hint of stress or strain. 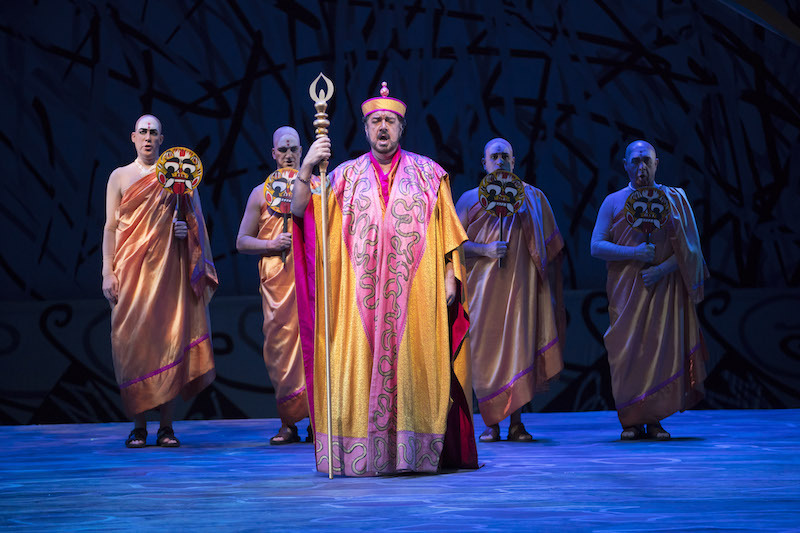 Playing Nadir was Evanston native Matthew Polenzani, whom audiences had the opportunity to see on stage as the Duke of Mantua in Lyric’s Rigoletto earlier this season. Nadir’s stratospheric tessitura in the Act I aria “Je crois entendre encore” was a thing of beauty in Polenzani’s hands. Audiences have learned to always expect greatness from this tenor, but his pianissimo upper register deserves a special note of admiration; very few would call these passages comfortable, but Polenzani rounded off every phrase masterfully as his voice melted into the orchestra. This was one of the several moments in the opera in which the music hit one’s soul dead on. Marina Rebeka’s powerful yet nimble soprano effortlessly danced along coloratura passages. The Latvian singer played Leïla, the mysterious veiled priestess. The Rossini and Mozart expert had it all fully under her command: trills, dynamics, intonation, and tone, none of which could have been better executed. One could easily hear that Rebeka would be an ideal Queen of the Night; her phenomenal breath support allowed her to jump all over her tremendous range, always with mind-blowing accuracy in intonation. Rebeka is the type of singer who makes it all seem so easy, even when it is anything but. Italian bass Andrea Silvestrelli’s big, powerful sound made him an ideal Nourabad, the high priest of Brahma. The Lyric Opera of Chicago chorus played a significant role in the production as fishermen, townsfolk, and priests and priestesses, as did the dancers (dancing has a tendency to come to the fore in French opera). Sir Andrew Davis, who is celebrating his 30th year since his Lyric debut, led a fantastic orchestra that brought out the fascinating colors scored by the young Bizet. This season thus far at Lyric Opera of Chicago has been nothing short of spectacular. 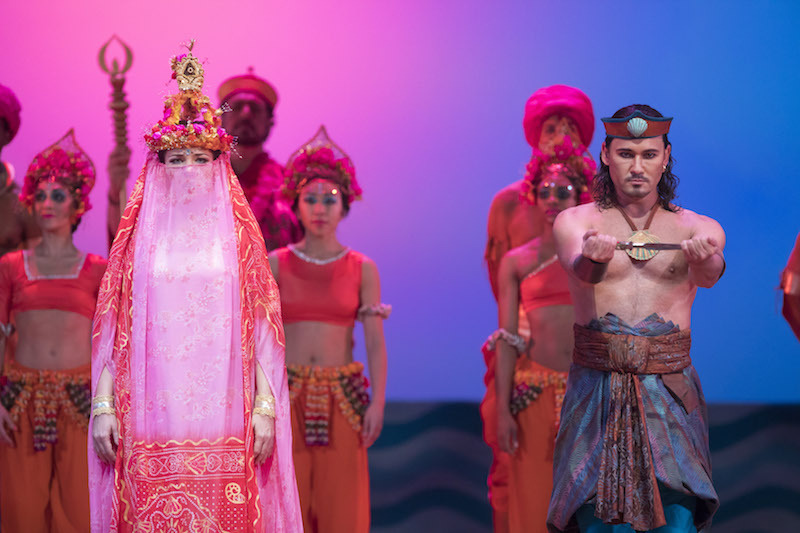 We’re already four operas in to the eight main stage productions being put on this season, and if The Pearl Fishers is any indication of what’s yet to come, we’re in store for some phenomenal opera.